Philippe Petit (Joseph Gordon-Levitt sporting a French accent and some eerily pale contact lenses) is a dreamer, a Chaplin-esque Parisian street performer and self-styled high-wire artist who we meet riding a unicycle in black and white. He lives a dreamy, magical life of following his passions, plying his trade, and romancing the lovely Annie (Charlotte Le Bon in a thankless girlfriend role), a fellow wayward street artist—a musician in her case. Philippe is always looking for the perfect place to put his wire, and when he stumbles across the still-in-construction Twin Towers of the World Trade Center, he finds the ultimate stage on which to perform. 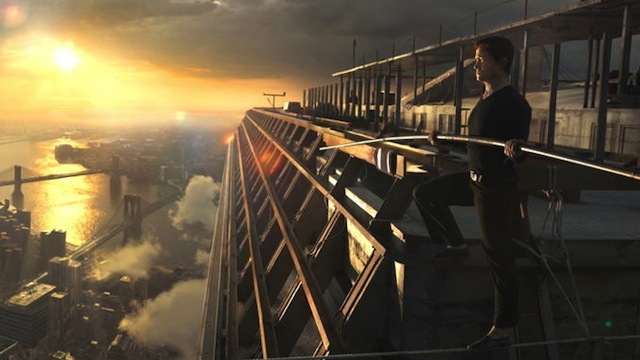 At its core, The Walk is a movie about a driven dreamer chasing an unattainable goal, no matter the odds or the consequences, and making a bold artistic statement in the process. For a good long while the script, which Zemeckis adapted with Christopher Brown from Petit’s memoir, meanders around trying to drive this point home. Philippe is charismatic and draws people to him and into his plan, even though everyone, himself included, knows it is insane, not to mention highly illegal. The early going of the film mires down in the set up and planning. While Gordon-Levitt is, like his character, charismatic and engaging, he’s barely enough to keep you interested, and The Walk spins its wheels. A clunky framing device where Petit, standing on the Statue of Liberty with the Twin Towers looming behind him, continually butts in to tell you what’s going on, doesn’t help matters. Instead of annotating the foreground action or enhancing the story, it simply repeats what happens on screen, coming across as condescending at worst, unnecessary at best. However, after the plan is set in motion, that’s when The Walk finds itself. The narrative intrusions fade into the background, and the film transforms into a jaunty heist as Philippe and his collection of “accomplices” invade the World Trade Center, set their wire, and execute the greatest artistic triumph of their lives. Here the action hums as the ragtag collective maneuvers around unexpected obstacles and finds themselves within inches of being thwarted numerous times. The outcome has been made readily apparent from the get go, so fact that the tension crackles like it does as the film builds to its climax, is an impressive feat. And what a climax it is. Whatever middling, underdeveloped story the initial acts deliver is wiped away and forgotten the instant Philippe steps out on that wire. 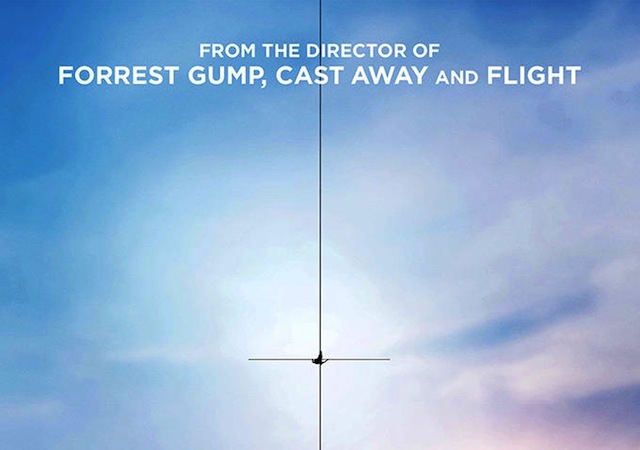 Using swooping cameras and squeezing the 3D IMAX technology for all it’s worth, Zemeckis places the audience right there, 417 meters above the New York pavement, with nothing but a single strand of wire for support. It’s a visceral, vertigo-inducing sensation; you can practically feel the breeze in your hair. 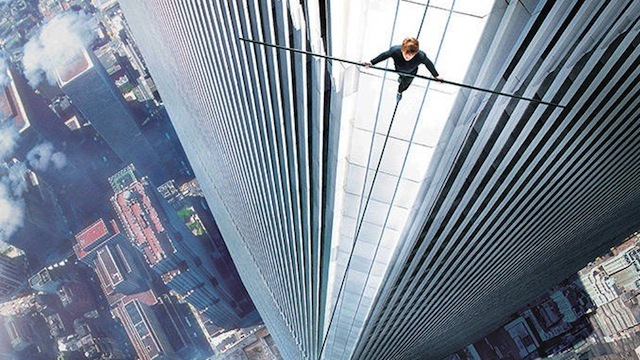 Dizzying and harrowing, this is spectacle filmmaking at its peak, and The Walk becomes more an experience than a simple movie, and feels as mad and impossible and improbable as Philippe’s plan. While Gordon-Levitt portrays Philippe as a magnetic, impulsive, manic personality who attracts fellow dreamers, not much is done with any of his cronies. They’re little more than a forgettable chorus of background players, each with a single personality trait to set them apart—one is photographer (Clement Sibony), one is afraid of heights (Cesar Domboy), one smokes a lot of weed (Benedict Samuel), and so on. Ben Kinsley, as Philippe’s high-wire mentor, and James Badge Dale, as one of his accomplices, try their damnedest to break out—they both give it their all—but the roles are simply too small and too underdeveloped to be memorable. Philippe is a madman, and those he surrounds himself with fade into the texture behind him. Zemeckis has a gift with visuals that is on full display in The Walk, and when the action kicks in, the plotting and structure move the film along, but when the characters open their mouths, that’s where the pace flags. The dialogue, among other elements like the music cues, is too on the nose and full of well-worn platitudes about how anything is possible and every dream can come true. And though the stakes are high—life and death, possible imprisonment—a goofiness undercuts and weakens this, and the film never truly decides if it’s a drama about artistic expression, an electric heist film, or a lighthearted romp.